I realize that nodes (both angular and radial) are areas with zero probablility of finding an electron. I realize that plotting the square of the radial eigenfunction for an orbital will give the probability density of finding an electron at a given distance from the nucleus. So for the 1s orbital (zero nodes), the graph of the square of the eigenfunction will be one hump. For the 2s orbital (one node) there will be a small hump followed by a large hump with a zero point in between them (talking about the sqaure of the eigenfunction not the eigenfunction itself). For the 1s orbital, the peak of the hump will represent the most probable radius the electron will be found from the nucleus. The probability will lower as the radius increases or decreases from the most probable radius (similar to gaussian distribution), and the electron will have zero probability of being found within the nucleus of the atom (0 radius). And from what I understand the radial node(for the 2s orbital) is physically manifested at the point where the 1s orbital and 2s orbital meet (my instructor used the analogy of russian nesting dolls), and on the NON squared eigenfunction plot of the 2s orbital, the node is represented where the wave function crosses the x axis going from +y to -y.
Edit: Perhaps it is incorrect to say an electron from the 2s orbital has the possibility of being in the 1s orbital. What I really mean is the electron may occupy the same space as the 1s orbital, but since orbitals are just 3d areas where an electron is most likely to be found perhaps I am not incorrect in saying that a 2s electron occupies the 1s orbital since the 1s orbital is technically just a region in space. My guess is that the probability of a 2s electron occupying the same space as the 1s orbital is lower than it occupying the space of the 2s orbital due to repulsion by the electrons that already occupy the 1s orbital. I realize that plotting the square of the radial eigenfunction for an orbital will give the probability density of finding an electron at a given distance from the nucleus. This isn't quite right. The square of the radial function will give the probability density for s-orbital, but this is not the probability of finding the electron at a given distance from the nucleus, because the number of points a given distance from the nucleus increase with $r^2$. To get the plots in Fig. c, the radial function squared in multiplied by $r^2$. For example, for 1s, the probability density is greatest at the nucleus, but by multiplying by $r^2$ when r=0, a radial probability density of zero is obtained. 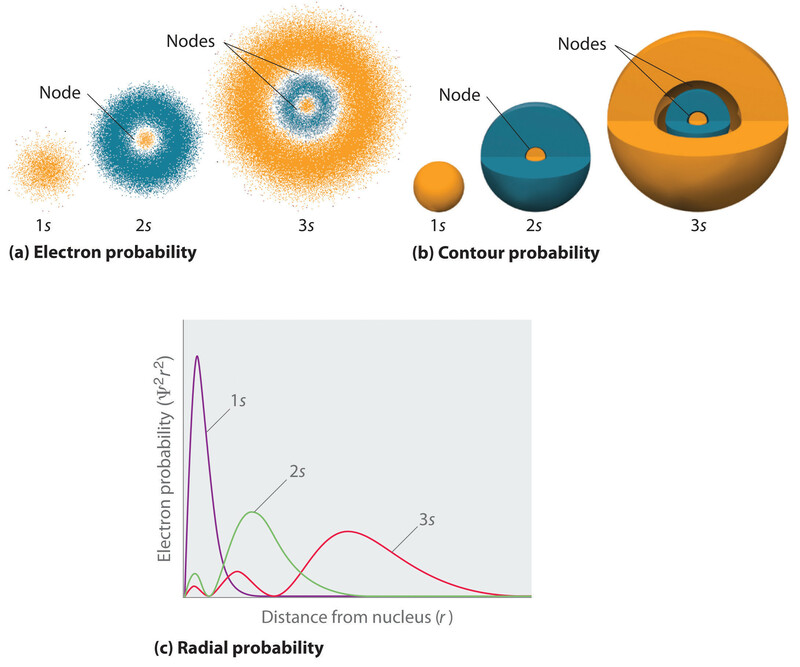 Furthermore, as you can see from the graphs on pages 187 and 188 here, for 2s and 3s the most probable location (highest probability density) is at the nucleus (r=0). Again, only by multiplying by $r^2$ when r=0, is a radial probability density of zero is obtained. So "Fig. a" in the OP is misleading, the central region of 2s and 3s should be shaded much more intensely than the outer region(s). No, the 2s electron is only in the 2s orbital. Not the answer you're looking for? Browse other questions tagged physical-chemistry atoms orbitals quantum-chemistry or ask your own question. Can the regions of 1s and 2s subshells overlap? Do multielectron atoms have nodes? How to obtain the radial probability distribution function from a quantum chemical calculation?